Here at Strata Homes, we’ve been getting into the spirit of things throughout August and September as Hull celebrates the Amy Johnson festival. We’re feeling really lucky to be involved with a festival right at the heart of Hull culture; so much so, we’ve been showing off our own multi-coloured creature as part of the appreciation of the city and one of its heroes. 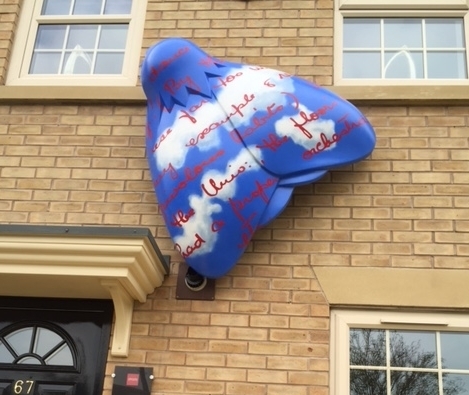 Our Moth, featuring red handwriting against a contrasting blue sky, is named Red Letter Days and has been specially selected to be displayed on the Amber showroom on Boothferry Road, Hull. The text was taken from love letters written by Johnson to her lover Hans Arregger, and was recreated by Ghanian born, Hull-based artist Isaac Acheampong. Design is hugely important to us as a company, and we were delighted to be given a chance to showcase this beautiful and eye catching piece of art on the side of one of our homes. With our roots in Yorkshire, we have welcomed the festival’s aims to raise awareness of Johnson’s achievements, promote art and culture across the city and encourage young women to consider engineering and the sciences as career choices through the presentation of positive role models and creative projects which explore technical, digital or mechanical ideas and applications. In what is set to be a huge year for the city as it takes on the mantle of the UK’s City of Culture for 2017, we’re keen to support and be involved in improving Hull’s exposure to a global audience.